Goober, this was made for the television generation (both the one Spielberg grew up in, and the ones that followed. There were a ton of teenagers (like me) and twenty-somethings that had been watching these 30-40 year old cartoons with references we often missed since we were old enough to be left in front of the TV. Yes the gags are creaky, but they were sure familiar. Remember, this is mid 80s, this was a dead time in American Animation (and the OVA boom was just starting and we didn’t know about it). So if the humor seems old, it wasn’t unfamiliar. And with all the re-tread “talent” on TV it wasn’t like it had really gone away yet. And “shave and a haircut” is classic toon grammer, it’s like “those endearing young charms”, you know the tune even if you have no idea what it’s from you know what notes come next. So, you were really about 5-7 years too young for this (and obviously not that grounded in the source material, which would be hard at that age). Now, and this is one point I kind of agree with you, most of the style and humor is VERY much on the wild and crazy side (very Bob Clampett, and Tex Avery’s wilder stuff, not much Chuck Jones at all, in fact he HATED what happened to the “dueling pianos” bit). This is probably a result of the type of animators you would get then, very creative but very much “do your thing”, and of course Williams went right back to NOT finishing his magnum opus after this. John Lasseter is the big Chuck Jones guy among modern animators, and he was at Pixar at the time. Also, remember this was when ALL animation was G (except for Back Cauldron and Bakshi’s crazy stuff. That PG MEANT something: a more “adult” (but no blood) plot, and bit more “behind the scenes” feel. And since this is really more a Warner’s film in feeling (yes Disney made it, sorta but the Warner feel is MUCH stronger). and since Warner’s cartoons were generally edgier (Jones himself remarked on the pictures they came before, most of those films weren’t for kids). And a 40s detective HAS a drinking problem, it comes with the hat, even Calvin and Hobbes knew that. So yeah, it’s not the perfect “cartoon movie”, but I think you spent so long complaining about jokes too sophisticated (and stories too scary for) a 7 -year old, and taking offense at anything remotely edgy or merely cringeworthy. What you missed was the biggest issue with watching it again, too much emphasis on the zany, not enough on timing and cartoon logic (the cuffs gag for example is classic cartoon logic at work). Oh, for the record I got the “Harvey” joke the first time through. How did a 14 year-old know about a movie that old? Because Dragon magazine had an article on Pookas. And a video game magazine also brought up the movie in regard to “Dig Dug” (where a Pooka is a tomato with sunglasses). I don’t remember Paul being so PC until recently. Man, if you guys think this is me being PC, you should hear me talk about a movie with more overt or obvious politics. Don’t know how to respond to that whole bit about “taking offense”. I’m not offended by Roger Rabbit, but if I think an element of a movie is racist or insensitive, I’m definitely going to point it out. I wouldn’t be being honest with myself if I didn’t. Reading Paul’s answer about the concerns over content in a film that hasn’t aged well has made me a little sad inside. It seems to be quite the nature of today’s world to pick at a lot of pre-21st Century stuff as if it’s all just problematic by today’s standards. I suppose I never though this way about a film before but it was not something I thought about growing up with it. The gorilla bouncer character for instance made sense to me since they needed a big, massive character for that, and making it a gorilla made sense for a brutish type. I’m sure that was the logic that went into characterizing it. Animator Preston Blair had had a similar gorilla highlighted in his famous book on learning animation that has been in print for decades. Jessica Rabbit’s appearance is loosely based on that of the famous Tex Avery “Red Riding Hood” character from several cartoons, especially those with Droopy and the wolf. 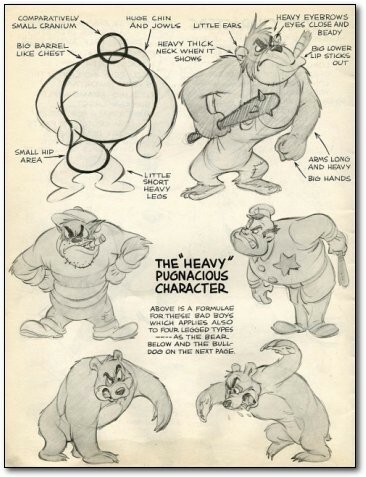 Preston Blair has been credited for animating Red’s dance sequences. I suppose had it been a normal human being in the role (and normally white), we wouldn’t think twice about that, but even with humans, you begin to deal with stereotyping up front. Chuck Jones actually said something rather interesting on the matter in the first of his two autobiographies, “Chuck Amuck”, published in 1989…. “In animated cartoons, we do generally prefer animals to humans. First, if your story calls for human beings, use live action. It is cheaper, quicker and more believable. If, as a director, I could train a live coyote and a live road runner to act, I would use them. I am an animator and an animation director; therefore, I look for characters that cannot be done in live action. That is what animation is all about; it is an extension beyond the ability of live-action motion pictures. Second, as said, it is easier to humanize animals than it is to humanize human beings; we are surrounded by human beings; we are subconsciously and consciously critical of other human beings according to how they deviate from our own behavior or from standards of behavior we approve of. Therefore, to many of us, everyone who looks like a cokehead is a cokehead. Everyone who looks like a bum is a bum. But, if so, what about the talent of Theodore Dreiser, who looked like an unmade bed? If all wimpy-looking people are wimps, what about Woody Allen? “It is in order to avoid these stereotypes that animators, as well as Aesop, Kipling, La Fontaine, E. B. White, Beatrix Potter, Felix Salten, Walt Kelly, and countless other writers, turned to animals. People look at rabbits or ducks or bears as a class rather than individuals, though it is true we stereotype these classes. We classify all snakes as repulsive or dangerous, when fewer than one snake in a million can or will harm us. We are revolted by spiders, when most spiders are beneficial to mankind and only one spider in a million is harmful to man, and then, like the snake, only if provoked. Reading this passage as a 12 year old was a bit of an eye opener to me over why these guys preferred to use animals over people in animation. Even with using animals in cartoons or stories, adding human personalities and caricatured to an extent is just something we do since we have nothing else to compare ourselves with. And this is why it bewilders me how people do look back on Pepe Le Pew or Speedy Gonzales and see racist tones that were apparently below the surface given the animals that are substituted in those roles. Of course even back then, you had people complaining over Porky Pig’s stuttering as well, saying it offended people who had a legitimate problem with it. Cartoons have always been about satire and commentary. People laughed because they didn’t think of themselves as being connected in the same way as what they saw on screen (much like the cartoon violence mentioned in the podcast). I’m sure it’s something that’s starting to grow out of us the way the world has become far more connected than it had been a century before. I guess it’s just a bit of a disconnect to me to see how much things can change over a lifetime. If there’s anything that got turned my eye a bit watching back on the film was Eddie’s rather blasé, casual approach with those kids he hopped a ride on the street car with who offered him smokes. I’m sure that triggers someone out there, being made Eddie didn’t do the right thing, of course he was already bumming a ride on a trolley he couldn’t pay for with a check! “DIP” by the way, is composed of Acetone, Turpentine and Benzene, materials certainly used to thin or remove paint. I never saw the death of that shoe or anyone affected by Dip as that frightenly awful though the thougth of being essentially erased out of existence (either in the living or spiritual world) is an interesitng concept to think of. The death of the weasels (except for the leader Smartass, yes that’s his name) certainly shows a cartoon heaven of sorts is possible given how they go. I didn’t find the weasels that offensive at all in this film, though they did remind me of the ones that served as an atagonist gang in Disney’s adaptation of The Wind in the Willows (seen as part of The Adventures of Ichabod and Mr. Toad). The weasels in that were very similar to these, except for the voices/personalities being patterned after gangster/thug types. The movie’s framing device of the buyout of the Red Car and anticpiating a suburban boom in LA was an actual even that film takes it’s premise from. Pacific Electric was the public transportation service for the area and had lines all over. It’s eventual shutdown was considered a conspiracy for many years, often due to the rise of the automobile in this country and an industry that boomed after the war. It was a nice bit of historic fact to lace into this story. Stories like these played out all over America when street car/interurban lines were being decommionsed all across the country. Toledo got rid of their’s in 1949. “Shave & a Haircut” was pretty much the meme of it’s day, the way cartoons have often used it in their music as a comic beat. Warner’s and Disney loved doing it a lot. Heck, even the classic WTOL children’s program “Patches & Pockets” did it (I hope Paul remembers that). Another one of those odd musical thing was “Those Endearing Young Charms”. Several Warner Bros. cartoons featured gags of someone trying to play the tune and not being able to hit the right notes during it (it was a trap). If there was one thing that flew through our heads without much knowledge over, it would be what someone told Eddie about Marvin Acme when he said “The rabbit CACKED him last night!” The word “CACKED” is an odd one, and was said in the commentary audio for this film that it came from a jazz musician who said someone was “cacked”. I wish I knew more about this, but that’s all I know. The slang thingy did pop up in one of the “Dr. Tran” shorts in the 2000’s as the name of a toy store Tran wanted to go to (Toy Cack). Of course today, we’re seeing “Cuck” become the new net lingo to describe someone being cheated on or losing something. Animation and Live-action combinations have happened before obviously, though often these were restricted to shorts and short segmetns in previous films. Noted ones made by Disney include Donald and Jose Carioca dancing with live action performers in The Three Caballeros, the nearly forgotten Song of the South, as well as a trip into chalk drawings on Mary Poppins or the Isle of Naboombu in Bedknobs & Broomsticks (and Pete’s Dragon). What made Roger Rabbit’s production a little unique was in how everything live action had to be filmed first, then blown up into individual frames with the animation drawn in place of where it was going to being that show. This was how they were able to make the animated characters look believalbe alongside their live-action counterparts. We’ve gotten this far and I still haven’t said much about the classic Jessica’s possibly “beaver shot” frames, or even Betty Boop’s bra slippage! Those are for another time! I see someone already brought up the “TV Generation” here. I suppose for me, that was the people who went to Who Framed Roger Rabbit. Those of us who liked those “Golden Age” classics of the 30’s and 40’s in particular. As Drew had already stated, this was during a rather dry spell when it came to animation in this country. The 1980’s was not a very good time to being in the industry, or even to care of it above the level of curiosity. Of course teens were going to shun this. They were not raised to appreicate animation beyond the kiddie aspects television brough it to. Even with that, the classics did come through from the likes of Disney, Warner Bros., MGM and more. Home video probably gave it a boost with the same carotons also being enjoyed via rentals or purchased at retail. It’s a reason why this film is often considered the catalyst for what became of the animation boom during the early 90’s when suddent studios and TV networks started giving a damn about it finally, such as Disney’s feature blockbusters like Beauty & The Beast, the debut of Fox’s The Simpsons, or even Nickelodeon and MTV’s original animated programming. None of that existed in the 80’s, outside of occasional short films you might’ve seen on Showtime one night as filler between movies or have heard of one that won an Oscar at the Academy Awards. The audience for animation itself had always been there, it just wasn’t being listened/catered to. One character not represented in the film, but was however shown somewhere in it, was Felix the Cat. Originally they wanted to animate Felix in the film but couldn’t get the rights ironed out in time, so the best they did was stuck his head above the tunnel leading into ToonTown. I saw Who Framed Roger Rabbit when I was 10, perhaps 11 if I saw it after my brithday in August (if it was still in theaters). I do recall my memory of where I saw it too. While Paul mentioned seeing it at a theater at the Woodville Mall (I’m guessing the Fox Theatre there), I saw it at the AMC Franklin Mall 6, outside of Franklin Park Mall, the original theaters they had there before they were torn down and replaced with the one built inside the mall. It was rather special since my mom wasn’t rich enough to afford more than the $1 admission we would pay to see a film at the AMC North Towne 5 Cinemas over at North Towne Square, or any other theater in town that did $1 admission, but these were for films that left the first run cinemas and were almost ready to come out on home video if possible. So it was nice not having to wait til it hit those theaters later. I probably begged my mom to take me to see it quickly. It was heavily markted during that time, like the Diet Coke ads they had on TV….